June 4 marked my Four Year Blogging Anniversary! It's hard to believe I've been blogging for such a long time. It feels like lots has changed in the blogging community since I began (and it really has), but the core has always stayed the same. A friendly, welcoming group of people who love books and love sharing that love. When I began blogging, I told myself that I would only continue doing it if I was having fun and I definitely wouldn't let it take over my life. I can say without hesitation, four years later, that it has totally taken over my life and I'm having a blast! 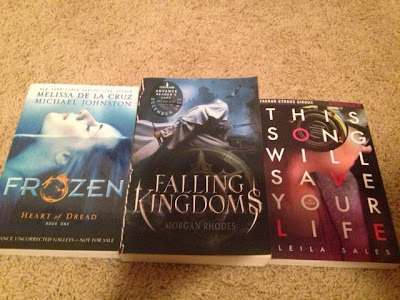 In celebration of four years, I'm offering an awesome giveaway. 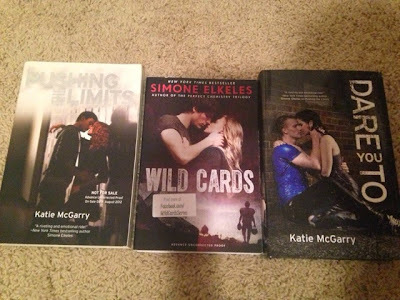 I'm giving away two sets of books to two readers! Looks like some great books!! I would love set number 2, my favourite song is Run Boy Run, by Woodkid. It's awesome. I would prefer set 1 and right now (althougth this varies a lot) my favourite song is Fences by Paramore :) Thanks so much for the giveaway and congrats on your blogoversary! Happy Blogoversary! Probably set 1. I've heard such good things about those books. Although, I really want to read This Song Will Save Your Life. Anything from One Republic right now. I would love set 1. Right now, my favorite song would have to be All of The Stars by Ed Sheeran! Happy Blogoversary! YAY!! Happy Blogoversary! Mine's at the end of this month -- how is it that FOUR years have gone by already?!? HAPPY FOUR YEARS BLOGGING, ALISON! That is quite the accomplishment. Thanks for the giveaway too. Happy blogoversary, Alison! :D That's so exciting! I'm coming up on my 7th blogoversary. I mostly wanted to come congratulate you, but I'll enter your giveaway just for the heck of it too. :D I'd prefer set 1 and my favorite song right now is still the Glee version of "Someone that I used to Know." I <3 Matt Bomer's voice. Happy blogoversary, Alison. Well done. I would like set 2. My favorite song, as soon as I read that I thought of Cruise by Florida/Georgia State Line. I'm not crazy about country, but it is a fantastic summer song, get in the car and drive with your window down and the wind on your face. Happy blogoversary!! Such a great and fulfilling accomplishment. I would like set 2. My favorite song right now would be Luke Bryan's "Drink A Beer." When I first heard it, it made me think of my two recently deceased older male cousins and their relationship with one another. Since this past week was the birthday of one, it has been weighing heavily in my thoughts, and I can picture Ricky and Mikey living out the words of the song. Happy Blogoversary! That is really awesome. Thank you for all that you share. I love finding about books I otherwise never would have ever heard of before, and blogs always help. I would love set #1. Looks fabulous. I not sure what my favorite song is. Tough choice. I just met simone Elkeles at a book event a couple weeks ago! Oh Alison! 4 years, really?! That is so incredible. Congrats!! I feel the same way about blogging in the beginning vs blogging now. A lot has changed, definitely, but I'm still loving it even if it has taken over my life a bit, heh. So here's to another 4 years!! I would like Set #2 and favorite song is anything by George Strait. Congratulations for four years! That seems like such a long time, but probably not when you can look back on them. Here's to another four (and hopefully) more years! 4 years!! Wow!! Great job and I have had fun reading your blog! I would prefer Set 2 and my favorite song right now is "Hey Brother" by Avicii. I'm pretty sure I'd go with either set since I haven't read any of them, but maybe I'd be number 2 first. I'm really interested in set number 2 (keeping my fingers crossed!). I don't have a favorite song currently. I have been listening to the album Rave Tapes by Mogwai before bed every night. It's pretty fantastic.